In these stories from issues #17-20 and ANNUAL #3, the spy stands alone. Tim Seeley is a comic book artist and writer best known for his work across publishers DC Comics, Image and IDW. His DC work includes GRAYSON and Vertigo's SHERIFF OF BABYLON, and he his now writing BATMAN following the events of DC Rebirth. Seeley's other writing projects include G.I. Joe: A Real American Hero, G.I. Joe vs. Transformers and New Exiles, as well as co-creator of the Image Comics titles Hack/Slash and Revival. Tom King is a comic book writer and novelist, best known for his work at DC Comics including GRAYSON and OMEGA MEN. 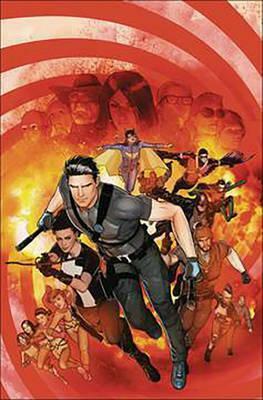 He often relies on his experience as an ex-CIA agent in his writing, especially apparent in GRAYSON (alongside co-writer Tim Seeley).